What is the site for McLaughlin and Haley? One more SoCon game to go!!! good showing or victory verses SCAR I could see this team at least 5th seed win it comes to playoff seeding. Prediction : Currently a bubble team as a #24 (Probably top 20 when new polls come out) . Of course if they win out verses Mercer and a depleted UNC team they are in. But I think they are going to need help from the CAA and the hope the Missouri Valley only gets 4 teams in and not a fifth. Prediction : Kind of hard to predict this one. I could see them going 1-2 or easily 0-2. If Kelvin McKnight returns before the end of season I don't see Furman beating Samford. And a loss that late in the season accompanied by not being ranked at the beginning of the season could have Furman the odd team out. Having 4 Losses, 1 being an FBS and 3 ranked opponents, you would think strength of schedule would get them in over any other 4 loss teams. Reason I state we could reach 5 or 6 at best is because #2NDSU loss this past weekend. They also play #6 South Dakota this coming weekend. Also #7 Elon will more than likely drop 1 or 2 of the remaining 2 games (@ #21 New Hampshire, #1 JMU). These 2 scenario's alone should jumps us 2 spots. I don't see Sam Houston St, UCA, or Jacksonville St losing any of their remaining games as they are facing 1 and 2 win type teams. Best bet for us to get in the top 5 is for Illini State to upset NDSU or a Wofford Victory over VMI and SCAR. Rankings are out for this week, we hold steady at #8. Basically, if Western wins this week, they are without a doubt in. If Furman/Samford win out they are in as well. The loser of their game in two weeks is likely sitting at home, just because of how strong the field is. to the post above.. it shows how little research said "COACHES" do. AGS has Furman at 15th - really 14th for playoffs because NCAT, in all likelihood, won't go to playoffs unless they lose - they want the HBCU bowl. STATS poll has Furman at 21. Take out NCAT and Grambling (probably not participating in playoffs) and FU is 19th. And the coaches... as you noted.. have us 28th. Take out the HBCU and we are 26th. *what does all this mean? I am NOT being pro-Furman here. I see it with other schools - IE, last week Citadel was still ahead of Furman in Coaches poll... In some polls, it is hard to get noticed but once you are in there it is hard to fall out. Which is BS - I would absolutely say the same if it were Wofford I was talking about. If you guys were not known to start the year and were 9-1 or 8-2 or whatever and just getting votes but not ranked I would call BS On that. Put it this way.. Western Carolina (doing well by all accounts) is in the coaches poll at 25th, so 3 ahead of FU, despite being behind Furman in BOTH the conference standings and h2head matchup. WTH These guys do 'slot' voting - they start w the top 25 and you have to just about shock the world to get in. Again, I would say the same for Wofford if it were affecting you all. People will say.. well, it sets you up for next year to start in top 25. Possibly yes. But what does that matter to a Senior who is playing now and wants playoffs this year in his last go 'round?? One of the polls has a 4-5 team ahead of us. Thanks for letting me rant here.. lol. I see several of you (YT, 19, Walliver) over on AGS. AGS is about the most reasoned poll - do I say that because FU is highest there? no I say it because they see how a team is doing, not what they were thought to do pre-season. Same as FBS, you should really wait until late October to do polls. At least the committee didn't release theirs until this week. But they only do a 'top ten'.. not a 'top 25' so we can't really see a ton. *CONGRATS TO WOFFFORD on top ten !!!!!!!! I agree that most FCS polls favor "the in crowd" a bit too much. Wofford used to get hosed all the time. Now we've been around for awhile and have been granted a small amount of respect which helps. If Furman closes out the season strong, gets in the layoffs and wins a game or two then they will be the "it team" in the SoCon like Wofford was this year and probably start out ranked in the teens which will put them in position to get some of this type respect going forward. As for AGS, that poll has enough diversity that the bias tends to balance out, but it's still a MVFC/CAA lovefest a lot of the time. Back when I posted on AGS and was a poll voter I automatically left off Ivy and SWAC teams because of the playoff issue (the MEAC participated at that time) and I got MAJOR pushback. Some posters even publicly called for me to lose my voting privileges, but I still believe that rankings should be reserved for hose who care enough to participate in the playoffs. Good post, Eyes. AGS is better than most, but there is a definite bias. I still don't see the love affair with Elon. They have had a great season, but the fact is that their two toughest games are the next two weeks. Elon, like Wofford, has beaten a couple of teams that were ranked when they played and were "name" teams in the FCS. Elon, like Wofford, has squeaked by every game they have won. However, Elon has been a bad to terrible team for the past 8-10 years. On the other hand, we made it through two rounds of the playoffs last year and nearly to the semis. Our record is the same as Elon and we have played all the better teams in our conference. I guess the Elon strength of schedule is given lots of weight, but it still seems that we should be ranked higher for many reasons. It would be hard to make a case that Wofford should be ranked ahead of any of the others above us right now-with the exception of Elon; but conversely, it would be hard to make a case that anyone ranked below us should be ahead of us. Roll over VMI and there will be no question. For many reasons it would be nice to see Elon get walloped at New Hampshire Saturday and then have the honor of hosting James Madison hoping to get into the playoffs! Go Furman...two weeks ago, Furman did not even have a vote in the "Coaches" Poll. I never post over on AGS, but I had to say something about it. It was not the AGS poll (Which is usually a better representation on how things should be). I hope Furman continues to improve... only benefits the SOCON. for what it's worth, the AGS poll controls for the bias of the fans who submit in the poll. The content of AGS is pretty MVFC heavy, kind of like how it was very App state heavy 10 years ago, but the poll is pretty solid. The problem is that it's easy to be critical of teams in FCS and say many haven't beaten anyone, but it's just assumed a priori that win against an MVFC conference opponent is better than a Socon conference opponent (because they've made playoff runs) but that's just not how averages really work if you squint. Those are top 8... Elon will bounce out... At New Hampshire then vs James Madison. Correct, at South Dakota could be a loss... Again, as I’ve stated, wouldn’t mind a 7 seed playing at Jacksonville State in the Quarters. And yeah, I know the committee takes 'time' to give you credit. I just don't think that is right.. AT ALL. Not for Furman, not for Wofford, not for anyone. Read the SRS rules or the committee statement - it talks SOS, WL, margin of victory, how you played late in season.. NEVER does it mention you need to have done well the year before. And it shouldn't. Think if your son was a senior on any team that had been having 3/4 wins and then his senior year qualified by every metric to be in the playoffs.. .but was not invited ! And the solace was, well, it will help get next years guys into the playoffs. That ain't a great silver lining for the kid that did all the work and is graduating. And then the next year team may falter... meaning the team that absolutely deserved to be in the playoffs - (you guys in that VMI year !~) - may never really got anything out of it at all. The bigger leagues do a better job and it just ticks me off for FCS. Think ACC basketball.. if Clemson goes 11-7 in ACC play etc. beats USC, and another decent team or so... They will take their RPI and resume and measure the heck out of it on ESPN etc. (blind resumes, sagarin, etc.) Clemson may not be a 'name' in ACC basketball but if they play to the standard.. they are in. no questions asked. They don't have to earn it for two years.. all that matters is THAT year. And yeah, I know the committee takes 'time' to give you credit. I just don't think that is right.. AT ALL. 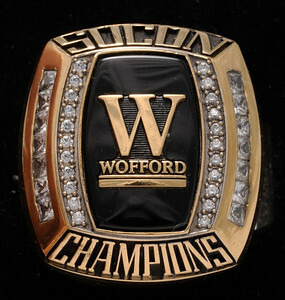 Not for Furman, not for Wofford, not for anyone. Read the SRS rules or the committee statement - it talks SOS, WL, margin of victory, how you played late in season.. NEVER does it mention you need to have done well the year before. And it shouldn't. Think if your son was a senior on any team that had been having 3/4 wins and then his senior year qualified by every metric to be in the playoffs.. .but was not invited ! And the solace was, well, it will help get next years guys into the playoffs. That ain't a great silver lining for the kid that did all the work and is graduating. You just described 2002. You could've heard a pin drop when they told us we weren't selected.